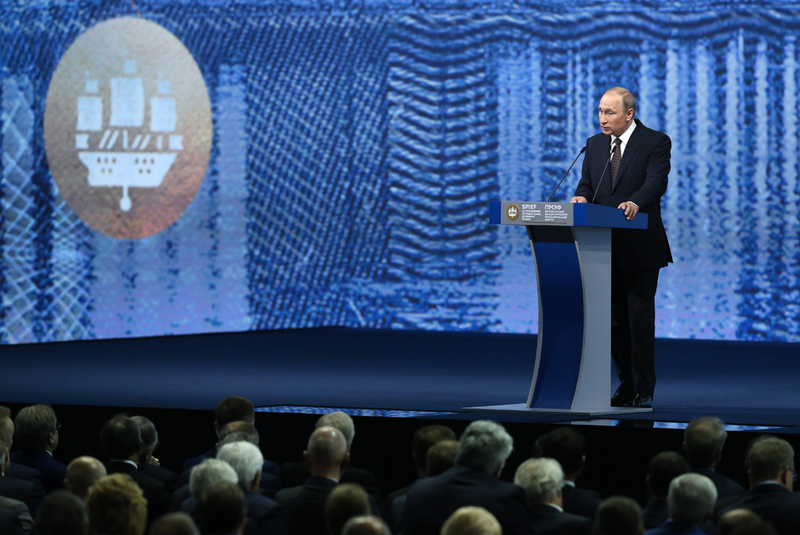 Russian President Vladimir Putin addresses a plenary session titled "Capitalizing on the New Global Economic Reality" as part of the 20th St. Petersburg International Economic Forum, June 17, 2016. President Vladimir Putin said it makes sense to form a broader Eurasian partnership on the basis of the Eurasian Economic Union (EAEU) that would involve China, India, Pakistan, Iran and a number of CIS countries. "We suggest thinking about formation of a great Eurasian partnership with the participation of the EAEU as well as countries with which we have already formed close relations: China, India, Pakistan, Iran and of course, we have in view our partners in the CIS, other interested states and unions," Putin said at the St. Petersburg International Economic Forum on June 17. Meanwhile, Kazakh President Nursultan Nazarbayev proposed to hold a Eurasian Economic Union (EAEU) - European Union (EU) forum to search for ways of rapprochement of the two integration unions. "When I was in Brussels, I talked about the necessity of holding a joint EAEU-EU forum to gather experts, scholars and businessmen and explain to them the essence of the union we have formed," Nazarbayev said at the SPIEF.